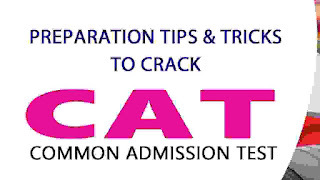 Strike the right balance For CAT Preparation - How to Prepare for CAT Examination ? How to Prepare for CAT Examination? A good way to plan your CAT preparation from now till November end, when the CAT is typically scheduled, is to see it as 45-week time period, and have a weekly schedule in place. It should allow you to balance your CAT preparation with your other engagements. One must understand that CAT is more a test of skill than knowledge. The skills that one needs to develop are how you think about problems, simplify them, make use of options by either selecting the right one or eliminating the wrong ones and get to the right answer in as less time as possible. Even when it comes to other skills like painting, acting, sports or music, you only get better with regular practice and not with sporadic bursts of effort. Two hours a day would take you farther than 14 hours dedicated to studies in one single day of the week. You can study regularly alongside your college or job. A BREAK IS IMPORTANT Day-seven should ideally be the rest day – that allows you to take a break and re-energise. A good performance in CAT requires you to be fresh in your mind rather than being exhausted and jaded by the time the CAT arrives. Assuming that you are engaged with a formal coaching for two days a week, which for most regular college students and working professionals might be the weekend, you essentially need to plan for the remaining five days for two hours a day. For the first few months of your preparation, this time should ideally be invested in getting basics right in various topics. This will prove invaluable later when you practice mock CATs and also when you actually appear for the CAT, because it allows you to select questions or leave them as per your strengths and weaknesses. In the initial stages of your preparation, you could look to devote 90 minutes to VARC (verbal ability and reading comprehension, which is basically English), DILR (data interpretation & logical reasoning, which tests your logical ability and ability to infer from data) and QA (quantitative ability, which revolves around mathematical concepts) in rotation on fixed days of the week. The remaining 30 minutes daily should ideally be devoted to the areas such as reading, listening, watching, writing and speaking. Language as a skill proves invaluable not only during the written test i.e. the CAT, but also during interviews, written-ability test and group discussions that form the final step in the selection to various top MBA colleges. This years( 2018) CAT Test Cut-offs may be lower than 2017 test. Abraham Lincoln famously said, 'Give me six hours to chop down a tree and I will spend the first four sharpening the axe.' If there is something that has justified the intelligence of importance good preparation deserves, it is CAT 2018. · Did CAT 2018 spring a major surprise this year? · Was CAT 2018 more difficult than CAT 2017? VARC section: The VARC section gave a mild surprise to students across both slots. Out went the taken-for-granted 6-Q and 3-Q passages. Making a wonder entrance were five question and four-question passages. That would have immediately enlarged the complete length of the content that needed to be read by test-takers to attempt the 24 RC questions. Decision-making for those who weren’t looking to answer all the RCs would have been riskier, what with all the RCs apparently of similar struggle level. The topics covered were also more unusual than usual — environment, biology, sociology, and history were the flavours of the day. The slight increase in difficulty in RC was mostly compensated for by easier VA sections in both slots, the vast relief for scholars being four-sentence Para Formation Questions. Odd-Man Out questions were also low-hanging fruits, with summary questions proving to be somewhat riskier. All in all, the VARC section hung around the same difficulty level as last year 2017; those who haven’t practiced a lot might have found it a little harder, given the nature of options in some questions and the intensity of the subjects. DILR Section: The DILR Section was comparatively easier associated to CAT 2017, but make no mistake, it was still very challenging in both slots of the CAT Exam. Though, unlike last year, there was at least one doable set in both the slots along with some manageable/fight-worthy sets. Both the slots saw some straightforward set types - Distributions/Venn-Diagrams/Calculation based sets. Nevertheless, the time that these sets demanded was a dampener which would contribute to lowering the cut-offs. Quant Section: The Quant Section in this CAT Exam 2018 proved to be the high tide in both slots. CAT Exam under Quant section was easily a few notches higher in difficulty level as compared to CAT 2017. This difficulty level was tempted mainly by the need to work around fixed methods. In this Section these is no low hanging fruits and very few questions could be solved without breaking a sweat. Quant Questions were long, and some also had extra conditions (read twists) that the scholars needed to watch out for. The number of Easy questions saw a obviously drastic fall compared to last year which will contribute to a steep fall in the cut-offs this year. The other seeming feature of the QA section this year is the continued focus on arithmetic. Pure-maths questions (on Functions, P&C, CG, etc.) were present, albeit lower in number. Within mathematics, the focus on normal suspects like Numbers was very low in both the slots, while Geometry, TW and TD had very good representation. While a very well-prepared scholar would not have broken much sweat, those who were tentative on their homework would have found out that the going was not as smooth as they would have liked it to be. Overall: CAT 2018 Examination was a smooth practice for scholars across the republic. From the students' viewpoint, it turned out to be more or less on the expected lines with a bit of fluctuation in the difficulty of sections here and there. The CAT Exam 2018 cut-offs are expected to be a tad lower than those of last year 2018, overall, QA being the spoilsport this time around. Disclaimer: This Information is taken from The Tribune Newspaper. This information was printed on weekly paper well known as “ Job and Careers” on the Front Page on 28th Nov. 2018.